Happy first day of March! This year is passing by so fast. I can’t wait to graduate in December, though. I am so ready! I shot this look on Sunday and really love this off-the-shoulder top. 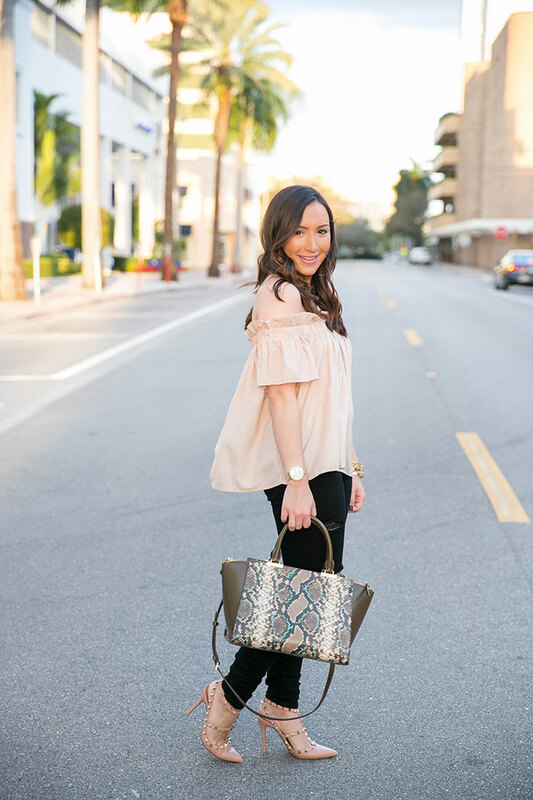 Lately, I’ve been on an OTS top quick, so this one is perfect to satisfy my needs for all things off-the-shoulder. I love that it’s a neutral off-the-shoulder and holds up well. One thing I can’t stand is when the shirt starts to fall down or continuously ride up! This one doesn’t do that, thankfully. I wanted to talk about my new purse! I recently received this beauty from Henri Bendel and love it so much. You can see it here. I also love this cross body style and this one! It’s such a great bag and really fits a lot. I also love that it has a strap, so I can be hands-free. I hope you all have a great day! Also, there’s a new YouTube video up all about getting to know me. You can see it here. Your top is such a pretty colour! I think I need to get that for spring. Off the shoulder looks are so stunning on you. I love your new purse girl, it’s a great neutral statement (if that makes any sense, haha). I love that off the shoulder top! Also the distressed jeans with those shoes is really cute and unexpected! I love this look. That bag is gorgeous! Love the color of that top, and the OTS cut! The OTS top trend seems to be super in, I’m going to have to hop on that bandwagon, I love it!! Love love love everything about this outfit! Perfect to begin spring time! You’re adorable. 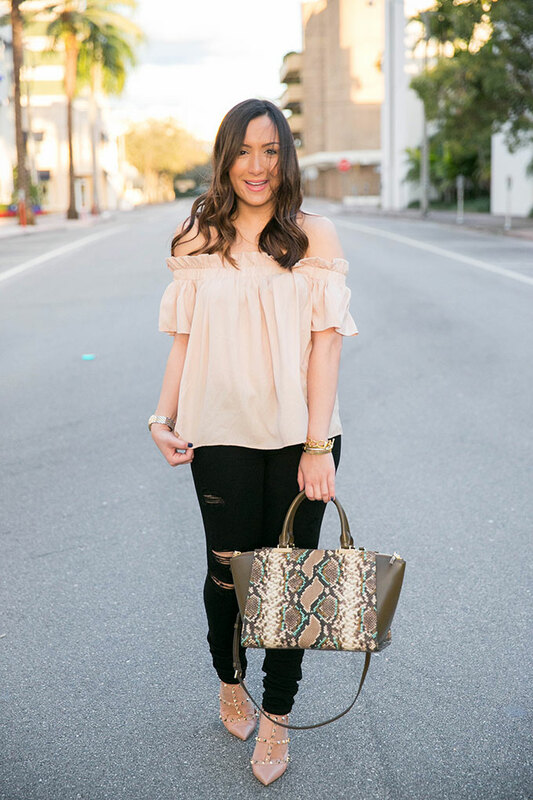 I love how you styled this top! I can’t wait for it to officially warm up so I can wear mine!! You are rocking this look!! I love that the top itself is very summer but the color is perfect for spring! Love your top, you look gorgeous!! 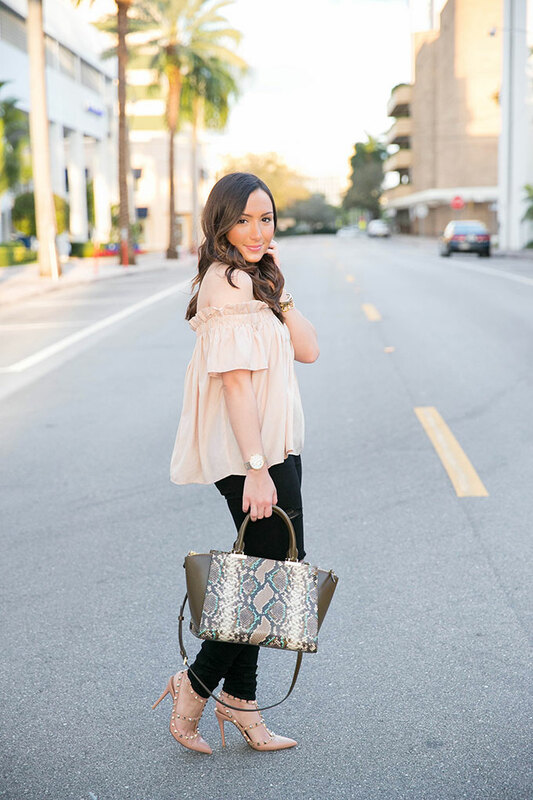 This blush top is absolutely gorgeous – you look stunning! I love off the shoulder tops! You look so pretty <3 Hope you have a great weekend! I would like to order this top. How does it fit? are you in a small? Yes I’m wearing a small! You’ll love it.